Alison Collis Greene is Assistant Professor in the Department of History at Mississippi State University. 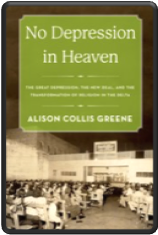 Her book, No Depression in Heaven: the Great Depression, the New Deal, and the Transformation of Religion in the Delta, was published in December by Oxford University Press. It tells a story of faith, famine, and the fight for survival in the Great Depression South. ECM: Your book issues a corrective to one popular but inaccurate narrative about the Great Depression and those who struggled through it. What is that narrative, why is it inaccurate, and how did it come to be so popular? ACG: The book opens with what I call the myth of the redemptive Depression. I guess you could call it our nation’s welfare origin story. Basically, it’s the idea that the Great Depression really wasn’t all that bad—or it was bad, but from adversity came redemption. People gave up luxuries they didn’t need, turned to their families, their communities, and their churches, and together rediscovered a simpler life and also maybe Jesus. But then, the story often goes, Franklin Roosevelt took office and put the government to work to end the Depression, and maybe people needed a little help getting back on their feet or maybe not, but either way, he really should have left things alone after a year or two. But he didn’t. So even though the Greatest Generation came through the Depression and WWII strong and self-sufficient, their kids and even more so their grandkids were weak and came to depend on all kinds of extra help from the government. I think it’s fairly obvious why this narrative is popular. It falls in line with a general nostalgia for a simpler time and with complaints about big government and welfare dependents. And it’s a very comforting story of triumph over adversity. But it mostly skips over the adversity, in part because that’s not a fun part of the story, or one people like to remember. The Depression brought the kind of suffering that tore families and communities and churches apart as often as it brought them together. Mothers handed over their starving children to orphanages because they couldn’t feed them; fathers hit the road to look for work and didn’t come home. That local supply chain fell apart in villages and small towns where drought ravaged the crops, falling prices made the rest worthless, and bank failures wiped out people’s savings. The churches that were for many rural people the only place to turn in crisis were broke too. In fact, I found over and over that religious leaders—conservative, Southern ones—led the call for federal intervention because they were powerless in the face of suffering. They applauded the New Deal, even claimed it as a religious accomplishment modeled on the social teachings of the churches. ECM: You note that, initially, many Southern clergy judged the Depression to be a religious problem with religious solutions—prayer, repentance, revival. They often claimed that the government “dole” posed a more serious threat than poverty. What changed their minds? ACG: They changed their minds for a few reasons: people needed help and churches couldn’t provide it. Calls for revival didn’t bring in either souls or dollars. A widespread critique of capitalism reemerged to characterize suffering as a result of systemic rather than personal failings. It’s also worth noting that most folks didn’t change their minds entirely. In general, clergy still opposed direct aid to the poor—the dole—because they thought poor people were irresponsible. The New Deal only provided such aid briefly, in limited fashion, and at the discretion of local administrators. Roosevelt instead touted “the joy and moral stimulation of work,” and that was his real focus—work relief was popular among Americans of all classes. Of course, other programs regulated the economy and protected workers, and then Social Security created a social safety net. But it was based on a payroll tax and really a very conservative program. In many ways, the New Deal seemed to many religious reformers to be an extension of what churches had been doing as they had helped patch together a limited safety net in the early twentieth century. Many southern cities did not offer municipal relief. Instead, denominations and municipalities provided institutional care: poorhouses, hospitals, settlement houses, orphanages, and so forth—all of them segregated, with far more resources for whites than for blacks. Local churches sometimes helped people with food, clothing, and fuel. At its best, religious aid was limited, and churches scrambled for donations to keep benevolent institutions afloat. Then the bottom fell out. The stock market and agricultural markets crashed, unemployment soared, banks failed, and a drought withered a year’s crops. National income dropped by 50 percent. People were starving, and sick, and broken. Churches weren’t doing well either. Until 1933, church giving held steady as a proportion of national income, but that still meant a 50 percent loss as demands on church resources peaked. Churches cut benevolent spending first, so now there were more people in need than ever before, and they had nowhere to turn. Churches that could no longer offer help began to ask for it. Religious leaders spoke less about the inadequacies of poor people and more about the inadequacies of a system that kept people poor. Alongside many other Americans, clergy began to demand that the federal government intervene to aid the suffering. Read the whole thing at Religion Dispatches. This entry was posted in Christianity, Culture War, Politics and tagged FDR, Great Depression, New Deal. Bookmark the permalink.